Cameras Downunder Gallery - Bakelite Cameras/BULGARIAN. Edelweiss 120 camera. 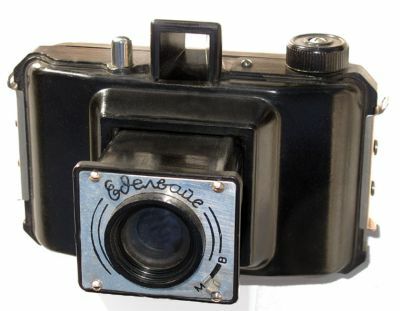 Edelweiss camera, a dual size Bakelite camera, for 6x6cm and 6x4.5cm. exposure on 120 film. there is a metal mask inside for the 9x4.5cm exposure. Pop out front. This is the first variation with only one aperture size, (the second variation has 2 apertures), 2 corresponding film windows on the back. fixed-focus, meniscus glass lens, this is the ONLY camera Bulgaria ever made. made by the ZKM factory ca.1950-1960. a rare camera.